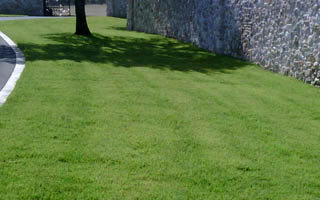 Billy Mayfield Turf Farms provides quality turfgrass for all your landscaping needs. Our sod is delivered to you in either rolls or blocks, ready to establish a natural green area so desirable to both residential and commercial clients. The friendly and knowledgeable staff at Billy Mayfield Farms will help you with selection, installation, care, and maintenance concerns. Whether you’re considering Zoysia, Bermuda, Buffalo, St. Augustine, or Centipede or any other variety of sod, we have the experience and ability to aid you in creating the perfect business or home lawn, park renovation, naturescape, athletic field, or golf course.